There are little assumptions to make in the above photo. After a few nights out together and rumors that Chris and Rih had rekindled their relationship, Hip Hop journalist Elliott Wilson snapped the pic for twitter. 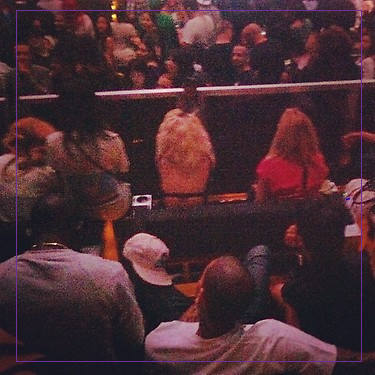 In it you can sligtly see VP, Def Jam & Chris' new manager Bu as well as Roc Nation's Rita Ora. It also appears that maybe Beyonce is in the photo as well. They are all great, but the world has it's eyes on the two in the bottom right hand corner- Chrianna. Chris and Rihanna were one of the hottest young celeb couples (if not the hottest) back in 2008. After their incident of domestic violence it seems the world has been against a reunion even years later. Even with Rihanna, her friends, family, and fan base for the most part forgiving and moving forward many have found this difficult to do. 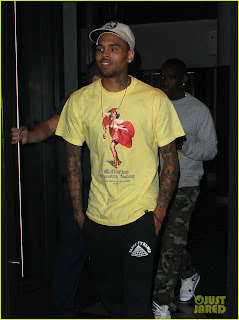 Regardless of how you feel about their reunion personally, it is obviously time to say hello to Chrianna again. "I have decided to be single to focus on my career. I love Karrueche very much but I don't want to see her hurt over my friendship with Rihanna. I'd rather be single allowing us to both be happy in our lives."